"For us, Greek Catholics, two things are decisive: values and relationships. 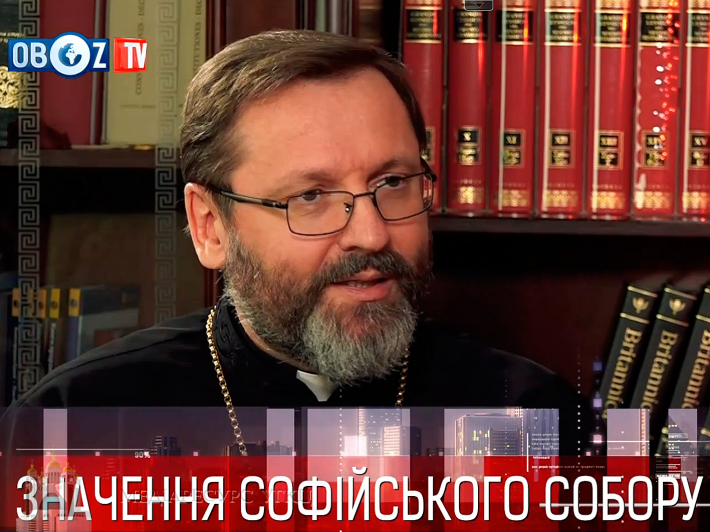 When we talk about the cathedral of St. Sophia, we mean certain Christian values, the Christian roots of European and Ukrainian civilization, and not a new place for worship," shared his thoughts Head and Father of the UGCC His Beatitude Sviatoslav in an interview for "OBOZ TV». "If we are talking about a discussion around the St. Sophia Cathedral, I do not really like it. After all, it has acquired a non-church character," added the Head of our Church. According to the spiritual leader of the Greek Catholics, the Cathedral of St. Sophia - our Kyiv Christian heritage - is a common ground where all its successors can meet. So now, this debate must turn into a discovery of our common roots. "If we are talking about the values ​​or Christian roots, then we want to draw attention that Saint Sophia is not only a temple, but a certain civilizational matrix of Kyivan Christianity, divine wisdom. Therefore, you may possess the St. Sophia Cathedral but not have Sophia of Kyiv," said the Head of the Church. He noticed that the question of Christian roots (both European and Ukrainian) is now in danger. "Why do I say that these values ​​are under a certain threat? For, on the one hand, we see that the ideology of the "Russian world," which in its own way interprets the content of Christian principles, wants to assign itself this type of roots. On the other hand, certain ideas about Europeanness (which, unfortunately, already prevalent in Ukraine) imply the rejection of the Christian foundation and values ​​... To my deep conviction, both of these are false statements. And when we talk about the St. Sophia values, we mean the foundation of our church. We need to enliven, open, and realize it. Unfortunately, the following opinion is often heard: whoever occupies Sophia, occupies Ukraine - this is about the possession of St. Sophia Cathedral. I think this is a very dangerous thesis," said the Head of the Greek Catholics. The Head of the UGCC noted that the desire to pray at the St. Sophia Cathedral was a desire to have access to the origins: "We asked for the opportunity to visit it. Unfortunately, authorities sometimes can make decisions that we do not fully understand. Our aspiration was motivated. However, we respect the position of our state and Orthodox brethren." In addition, His Beatitude Sviatoslav said that the UGCC wanted to show that she is also the successor to this tradition. St. Sophia Cathedral is also important for Greek Catholics. This was a good reason why the UGCC made a request to conduct the Liturgy on April 7 in the cathedral. "In my opinion, inter-church relations must undergo a radical rebirth, transformation ... We must see each other not as a competitor, but as a fellow brother ... It is worth noting that we had many events in Sophia of Kyiv. The last event that we experienced in this cathedral was the presentation of the Galician Gospel of 1144. Moreover, I then had the honor to visit and present this gospel to Patriarch Filaret and the then head of the UAOC Metropolitan Macarij. This was not the first time when we were present there organizing events," reminded the Head of the UGCC.